WOW! What a spectacular Retro style Demi Parure comprised of a necklace and bracelet. Please note the pictures DO NOT do it justice and I am sure you will be thrilled with this Extraordinary Statement set. 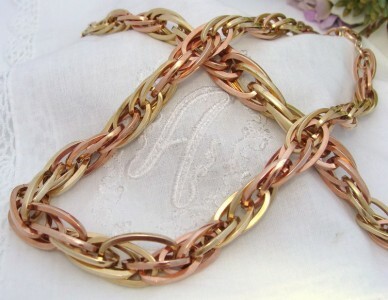 It is fashioned with that Retro look of combining Rose and Yellow Gold hues with fabulous effect! orming a twisted rope style chain. color. Each is finished with their original thick spring bolt clasps which are in perfect working order with a thick jump ring soldered to the chain. While the necklace is short compared to today's standards/sizing, I am including a chain extension that will add a further 6.5cm or almost 3". They have the silky smooth feel usually only associated with solid carat gold and expected of quality antique jewellery. Their warm yellow & rose gold hues are so much nicer than the pictures suggest. Construction: Gold Filled - marked 1/20 12KT G.F. Weight: 26.5 g + 55.5 g = a heavy 82 grams! MINT Vintage condition! This is a superb set appears to have never been worn - there is no wear, damage, denting or flaws to note. If you like those impressive, eye-catching pieces of jewellery then you will be thrilled with this. Perfect for lovers of Retro styling and priced to sell! You’ll be thrilled, guaranteed!